General class info, weapon statistics, character unlocks (items and hats), basic strategies and advanced strategies for the Soldier in Team Fortress 2. Special Abilities: Rocket Jump: Shoot below yourself as you jump for increased height. Special Abilities: 1. Rocket Jump: Shoot below yourself as you jump for increased height. 2. Rockets travel 80% faster than the standard Rocket Launcher. 3. Mini crits targets that are airborne from rocket blasts. 4. -70% radius for splash damage. Special Abilities: 1. Soldier's rage meter will fill with damage dealt during one life. 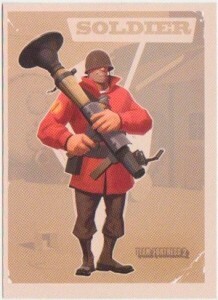 Once at 600 damage the meter will be full and the Bugle can be used. 2. Wielder and all teammates in a medium radius deal mini crits for duration after bugle call. Special Abilities: -75% damage to self when rocket jumping. Special Abilities: Damage and movement speed increases depending on how low the health of the wielder is. Taunt: 6 ft. range instant kill. 4 second warm-up. Does 256 damage to yourself. Special Abilities: 1. Gives wielder 2x capture speed. 2. Receive an additional 10% damage from bullet based weapons. At the start of a round, you can shoot rockets directly below yourself to drop your health. This gives Medics the ability to use their medi-guns on you and and achieve an Ubercharge at an accelerated rate. (*Warning*) When being healed or Ubered by a Medic, don't pull out your equalizer! Medics cannot heal you while it is equipped, and if Ubered you will lose the buff. Unless you are pro and know how to lead targets at varying distances for direct hits, aim at their feet or at walls around them to hit them with splash damage. Most likely, even if your aim is decent, the player will be able to dodge your rockets at great distances if they're coming head on and will deal no damage. However it is much more difficult for them to dodge splash damage. (*Warning*) Pyro's have the ability to reflect your rockets back at you. This ability is harder for them at closer ranges, yet is basically guaranteed at longer distances (depending on the player of course). Instead, use your shotgun on them or use it until you're close enough for some fancy close range rocket work. When dealing with Sentries, there are two basic methods to deal with them. If you're at a decent enough distance you can pummel it with direct rockets as about 2 will take it down. If you're finding yourself in it's cone of fire stay behind a corner and shoot rockets at the floor near it using splash damage to take it down (about 3 rockets). This method also works when an engineer is camped out behind his gun with a dispenser. Start your splash damage rockets towards the ground where the dispenser is first, to cut off the Engineer's supply of health and metal, then tackle the gun (or Engineer if he's managing to be a pain). When low on health and stuck in a hopeless situation, you can use your Equalizer to pull a quick escape if your health is low enough. You can also use the Equalizer to make a quick run with the Intel in a CTF map as carrying it does not affect your speed. If you're feeling daring, you can use your Equalizer taunt (the suicide grenade) to take out multiple enemies at once if you find that you're in a no-win close quarters situation and about to go down yourself.